One card - two challenges :-). There is a great sketch to follow for this week`s A Spoon full of Sugar challenge. Over at Cute Card Thuesday the challenge is "Nip and a Punch" - die cuts and punches. This is my interpretation of the sketch. I used Fiskars` border punch and the labels are cut out with Cricut. Åh, herlighet, så lekkert *dååån* Og sååå nydelig med den blomster ranken! So cute love it all! Takk for i går, koselig!! Your card is so beautifull with all that lovely details ! And beuatifull colors aswell ! Wowww Beata,what a beautiful card,l love the image and colours. 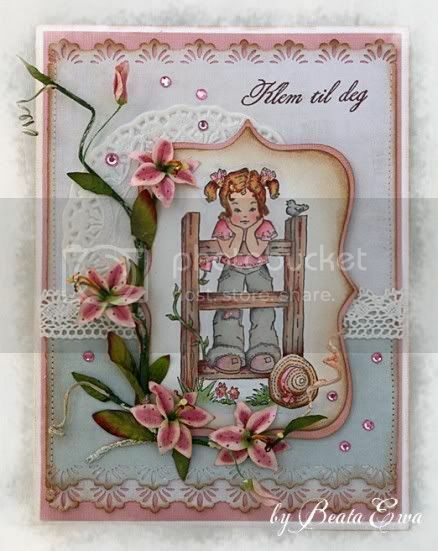 Very beautiful card, Beata, gorgeous details! Thanks so much for playing with my sketch..
And I love the flowers you have used! Nyyyydelig og vakre farger som alltid! The details on your card are amazing, great job. Fantastisk lekkert:O) Nydelige de blomstene, fantastisk flott fargelegging, aldeles bedårende!